Maria Mylopoulos, PhD, is a Scientist and Associate Director at The Wilson Centre. Her research program explores the development and maintenance of adaptive expertise, with a particular focus on how health professionals deal with uncertainty, novelty and complexity in their daily clinical problem solving. The aim of her research is to evolve understanding of adaptive expertise as it occurs in real world contexts. The ultimate goal of her research is to translate this understanding to educational design that promotes the development of adaptive expert clinicians who are able to handle the complexities and challenges of the healthcare workplace. In this era of increasing complexity, there is a growing gap between what we need our healthcare experts to do and the training we provide them with. While health professional education has a long history of being guided by theories of expertise to inform curriculum design and implementation, the theories that currently underpin our educational programs do not account for the expertise necessary for excellence in the changing health care context. Adaptive expertise provides a theoretical and educational framework for understanding and developing the experts we need. In this discussion, Dr. Mylopoulos will present the imperative for adaptive expertise in healthcare and describe the science that supports strategies to foster adaptive expertise through education. 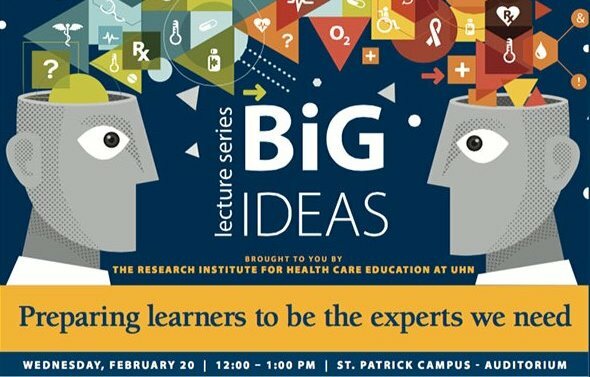 Please register for the Big Ideas Lecture Series: “Preparing learners to be the experts we need” on Feb 20, 2019 at 12:00 pm EST by clicking here.